Being aware of visual field loss. In robotics, a device; such as, a camera, which uses reflected light to find and to identify an object and sends the information, in the form of electronic signals, to a controller. Military ordnance, a narrow aperture (opening) in a military tank or armored vehicle to allow the crew to see outside the vehicle. 1. Having the nature of fantasies or dreams; illusory. 2. Existing in the imagination only; imaginary. 3. Characterized by or given to apparitions, prophecies, or revelations. 4. Given to daydreams or reverie; dreamy. 5. A person with fanciful speculations and enthusiasms with little regard for what is actually possible. 1. Produced by, resulting from, or originating in the imagination: Eve is a visionary who thinks that women are treated as equals to men. 2. Someone who has clear concepts as to what should happen or be done in the future: The politician is a visionary who is convinced that economic problems can be solved if labor unions and commercial companies cooperate and work with each other. 3. A person who has a religious or spiritual experience in which he or she sees a holy person who is not living or a holy event which cannot be explained scientifically: Adam's mother is known as a visionary by those who have gone to her for spiritual guidance. © ALL rights are reserved. 1. Lacking the faculty of sight; being blind. 2. 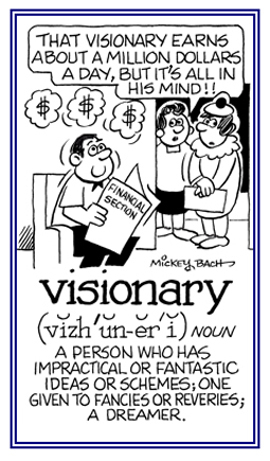 Without intelligent foresight or imagination; uninspired: "Our government seems to be full of visionless bureaucrats." 3. Destitute of vision; sightless. 1. To go to see or to spend time at (a place) with a certain intention: "We went to visit a museum during our trip to New York." 2. To go to see in an official or professional capacity: "The senator went to visit the President." 3. The act or an instance of visiting a person, a place, or something. 4. Etymology: "come to (a person) to comfort or to benefit", from Old French visiter, from Latin visitare, "to go to see, come to inspect"; from visere, "to behold, to visit" (a person or place), from videre, "to see, to notice, to observe". 1. The action of seeing, an instance of visiting, or an instance of being visited or seen. 2. Etymology: "a visit by an ecclesiastical representative to examine the condition of a parish, abbey, etc. ", from Latin visitationem; from Old French visiter, from Latin visitare, "to go to see, come to inspect"; from visere "to behold, to visit" (a person or place), from the stem of videre, "to see, to notice, to observe". 1. Belonging to or pertaining to a judicial visitor or visitation. 2. Referring to any authorized inspector or examination; such as, a doctor going to a retirement home to check on the health of the residents. 1. Someone who visits a person or place; for example, a caller, a guest, a tourist, etc. 2. An online website viewer or an internet user who views a website. 3. Someone who is authorized to visit a corporation or any institution, for the purpose of seeing that the laws and regulations are observed, or that the duties and conditions prescribed by the founder or by law, are duly performed and executed. 4. Anyone who goes to see or to spend time somewhere for reasons of friendship, business, duty, travel, etc. 5. An out-of-town team that travels to an opponent's stadium or sports field to play a game. 1. A hinged front part of a helmet, made of transparent or tinted plastic and designed to protect the face or eyes; especially, on helmets worn by motorcyclists or welders. 2. A flap mounted above the windshield inside an automobile used to shield the eyes from sun glare, etc. 3. A shade for the eyes attached to a band worn around the head or the front brim of a cap. 4. A hinged metal front part of a medieval helmet in a suit of armor, designed to protect the face and fitted with slits for the eyes to see through. 5. Etymology: from Middle English viser; from Anglo-Norman, from vis, "face, appearance"; from Latin visus, "a look, vision"; which came from the past participle stem of videre, "to see". 1. A disant scenic or panoramic view or sight. 2. A view seen through a long narrow opening; for example, between rows of trees or buildings. 3. A mental picture covering a wide range of objects or a long succession of events in the past or the future. 4. Etymology: "a view or prospect", from Italian vista, "sight, view"; from vedere, "to see"; from Latin videre, "to see".